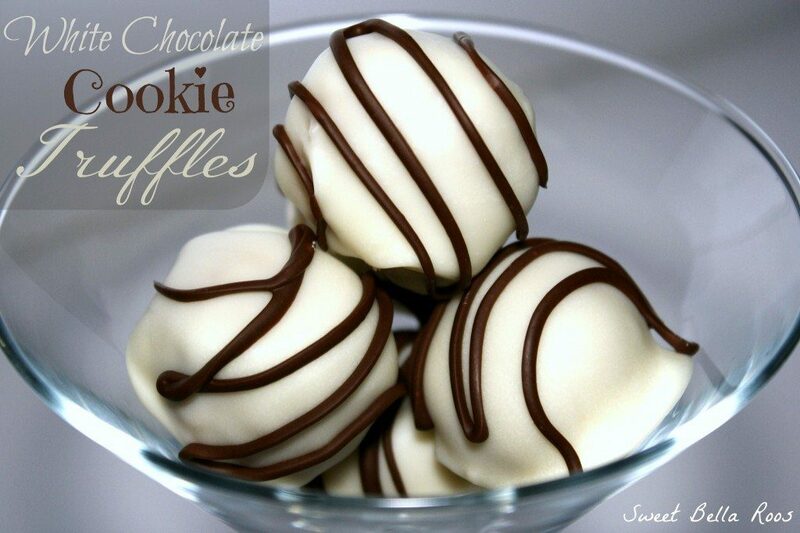 White Chocolate Truffles with dark chocolate drizzles on top of them. They are the most delectable truffles you will ever put in your mouth and easy to make too! On low, use a hand-held or stand mixer to blend together the wafer crumbs, cream cheese and latte mix in a medium-size bowl until it forms a smooth dough. Spoon out about a tablespoon of dough and roll into a ball. Place each ball on a parchment paper lined baking sheet, repeating until dough is gone. Place in freezer for at least 1 hour. Makes approximately 1 dozen. Melt almond bark in microwave safe bowl on high for 90 seconds being careful not to burn chocolate. Stir until smooth and fully melted. Remove frozen truffle balls a few at a time. Using a fork and spoon, dip and roll to coat. Pick up on end of fork and gently tap to remove any excess chocolate. Place on parchment paper to set up chocolate to harden. Repeat with remaining dough balls. Melt dark chocolate in microwave in 20 second increments, stirring until melted and smooth. Using a spoon drizzle dark chocolate onto dough balls sweeping back and forth to create dark chocolate pattern. Store in airtight container in refrigerator after chocolate has set.